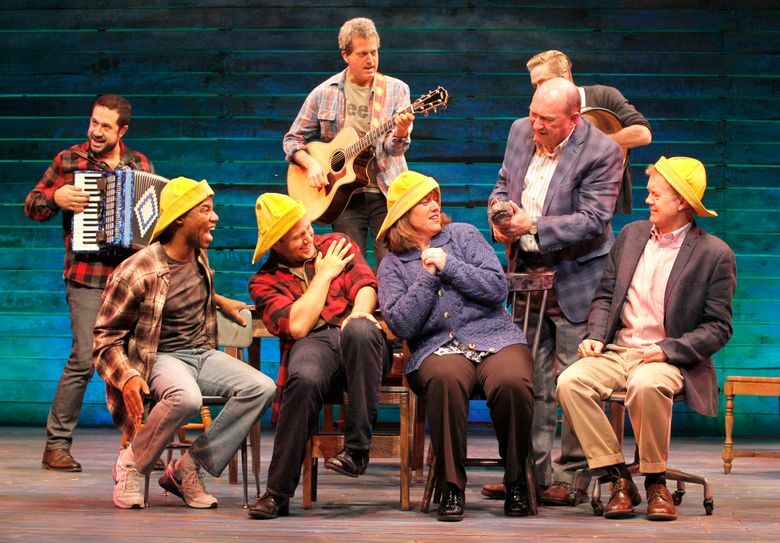 “Come From Away,” a rousing new show about a Canadian town’s kindness to strangers after 9/11, is at Seattle Rep through Dec. 20, 2015. In this world, any honest depiction of compassion that genuinely transcends national borders and cultural differences is most welcome. But after the recent string of savage terrorist attacks that have stolen hundreds of innocent lives and triggered xenophobic hysteria from some politicians, the new musical “Come From Away” is an especially timely, meaningful balm to the benumbed psyche. This rousing, inspiring yet unpretentious show, a coproduction of La Jolla Playhouse (where it debuted earlier this year) and Seattle Repertory Theatre (where it’s playing now), chronicles in one briskly engrossing act a small Canadian town’s response to the 9/11 terrorist attacks on the U.S.
by Irene Sankoff and David Hein. Now extended through Dec. 20 at Seattle Repertory Theatre, Seattle Center. Tickets from $17 (206-443-2222 or seattlerep.org). Written and composed by the Canadian duo Irene Sankoff and David Hein, “Come From Away” features a smartly choreographed acting ensemble loaded with versatility and presence. In the intimate style of other recent, just-folks chamber musicals, they heartily sing, dance and talk us through a true-life tale set in the remote Atlantic community of Gander, Newfoundland — “the Rock,” as the locals call it, in the twangy, foot-stomping opening number. We’re there at a friendly Gander cafe on the morning of Sept. 11, 2001, as the town learns of the terrorist attacks — and the 38 commercial flights set to arrive imminently at their sleepy airport. The jets were diverted from U.S. destinations after al-Qaida members hijacked planes and crashed them into the World Trade Center and two other sites. A good-natured local cop (played by Eric Ankrim), a nervous young TV reporter (Kendra Kassebaum), the homespun Gander mayor (Joel Hatch), a take-charge good Samaritan (Astrid Van Wieren) and other townies are first shocked, then dazed by the news. But they soon snap into action, to prepare for over 6,000 new arrivals — in Newfie slang, the “come from aways” — who’ll nearly double Gander’s population. On a rustic turntable set scattered with mismatched chairs, director Christopher Ashley expertly, fluidly alternates amusing scenes of townfolk whipping up supplies and emergency shelters, with glimpses of a single plane-full of anxious passengers. These “plane people” are a diverse lot, carping but coping as they wonder what’s happening, and wait (for 24 hours-plus) on the Gander tarmac. There’s the efficient, frustrated female pilot (Jenn Colella); a wisecracking gay couple (Chad Kimball and Caesar Samayoa); the mother (Q. Smith) of a New York firefighter; a shy Englishman (Lee MacDougall); and a lonely Texan (Sharon Wheatley). When the foreign arrivals get to town, hopeful locals (the performers double as both visitors, and Ganderites), graciously offer phones, beds, casseroles, company. But this isn’t, thankfully, a Hallmark Channel version of events. A wary African-American passenger (Rodney Hicks) understandably (and with mordant humor) fears racist treatment from the largely white, rural community. An Egyptian traveler (also Samayoa) is met with chilly suspicion (like so many North Americans of Middle Eastern descent, since 9/11). But in a moving number, Jews, Muslims and Christians simultaneously pray together, in their own ways. Yes, at times the vivacious choral singing and instrumentals (from a live combo led by Ian Eisendrath), the camaraderie and shared whiskey, suggest a spontaneous, five-day party. But for all the conviviality, piercing spasms of anguish and dread many of us felt on 9/11 — and feel again today — are also very present. A musical cannot vanquish our fears, nor prevent more global violence and divisiveness. What “Come From Away” does splendidly is give us a breather, and the benefit of the doubt, as it honors our capacity for humble goodness and mutual empathy in the shadow of faith-shattering evil.